This book provides a rich and accessible account of genre studies by a world-renowned applied linguist. The hardback edition discusses today's research world, its various configurations of genres, and the role of English within the genres. 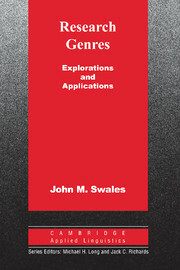 Theoretical and methodological issues are explored, with a special emphasis on various metaphors of genre. 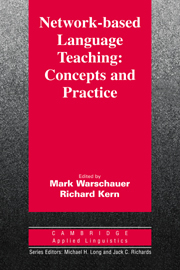 The book is full of carefully worded detail and each chapter ends with suggestions for pedagogical practice. The volume closes with evaluations of contrastive rhetoric, applied corpus linguistics, and critical approaches to EAP. Research Genres provides a rich and scholarly account of this key area.  Comprehensive coverage (over 400 references).  Deals with both speech and writing research genres.  Author is leading figure in genre analysis. This text provides a critical collection of recent research in on-line communication for second language learning.